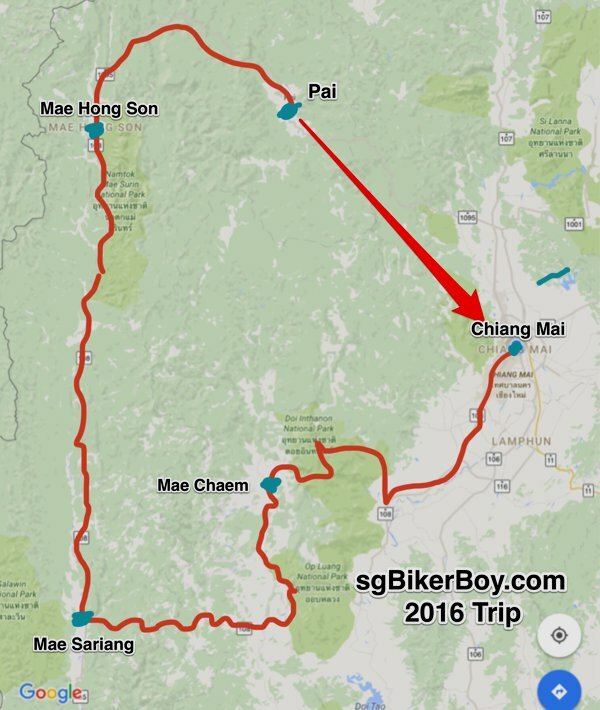 The famous Mae Hong Son Loop starts from Chiang Mai and runs through Mae Sariang, Mae Hong Son, Pai and back to Chiang Mai. 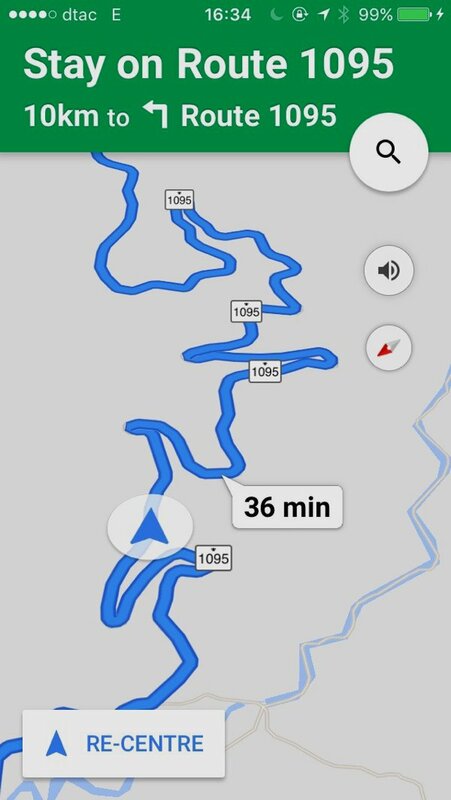 With more than 1,800 bends, and almost 700km of awesome views, it’s a motorcyclist’s (and basically any traveller’s) paradise! I was the only guest in the guesthouse, and so had the whole breakfast table to myself. 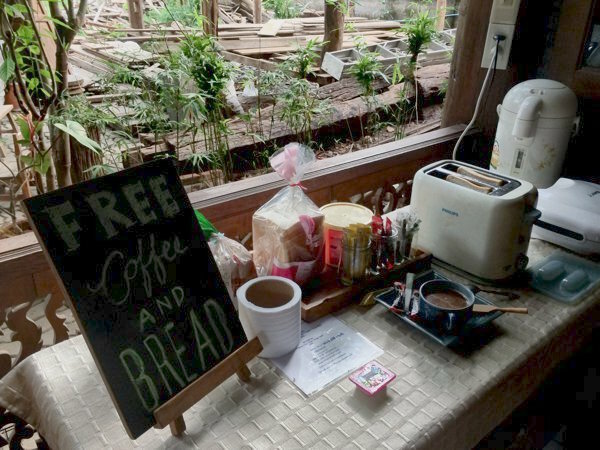 Basic breakfast in a typical Thai guesthouse – bread, jam, coffee, and nothing much else. 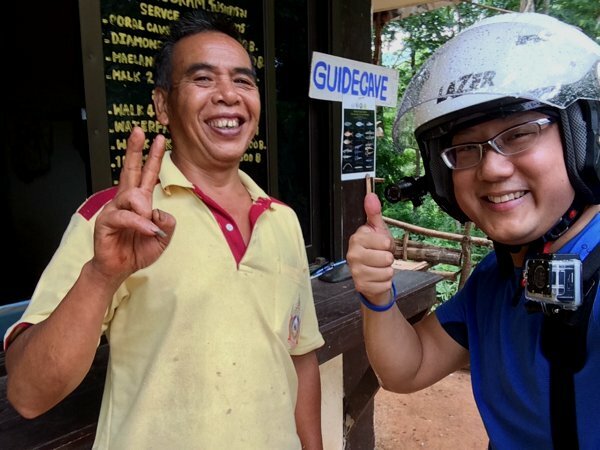 After breakfast, I took a short ride to the nearby Mae Pan Waterfall, or Namtok Mae Pan. 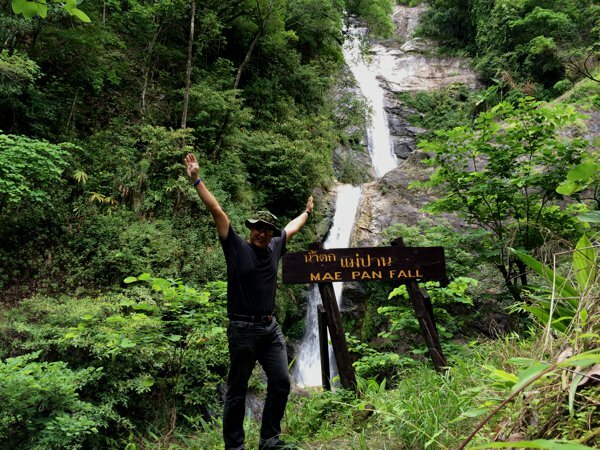 Mae Pan Fall is the highest waterfall in Chiangmai and cascades down a cliff more than 100m high. So it must be real awesome, right? But when I arrived, I was the only vehicle on site, and the place looked eerily deserted. Doesn’t look very much visited here, and the sign says it’s a 500m walk to the waterfall. Not too bad, I thought. It’s a 500m trekking trail. 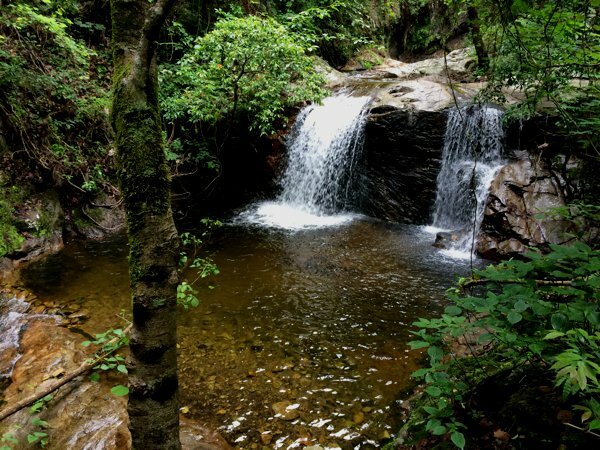 And although the path was rather clearly marked, the uneven and slippery ground with thick undergrowth flanking on both sides make the trek to the waterfall not for the average tourist. Thankfully my thick jeans, waterproof Sidi riding boots, and my military-issued jungle hat fended me from the thorny plants that seemed to booby trap the path. My arms didn’t do too well as the t-shirt did little to protect, and I ended up with some light scratches on both arms. Finally! Reached the main fall in Mae Pan. I must say that it’s actually a lot more awesome than what my iPhone camera could capture. 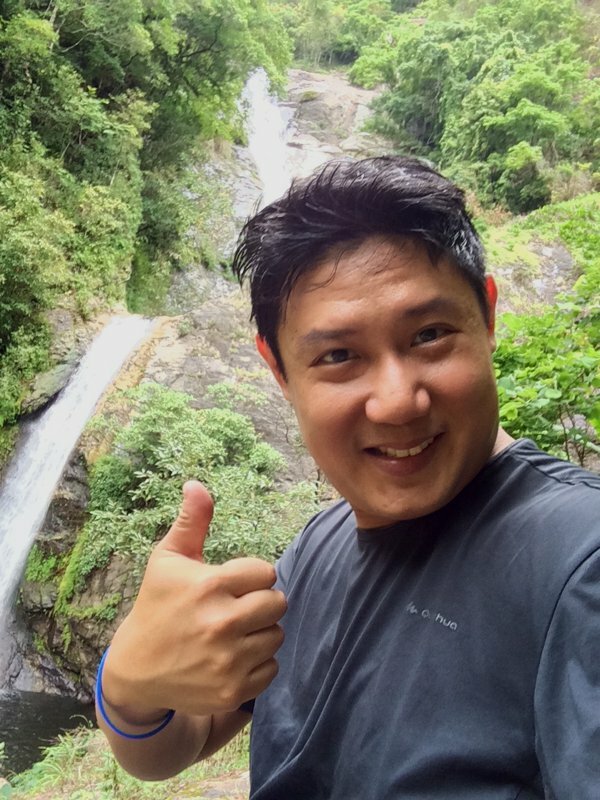 Thumbs up for the sweaty trek! Past some corn fields along the way. Not sure if these crops were grown for consumption or for ethanol. Gasohol – gasoline (petrol) and ethanol mix in 90-10 (E10) and 80-20 (E20) is common here in Thailand. Couldn’t resist a wefie moment. 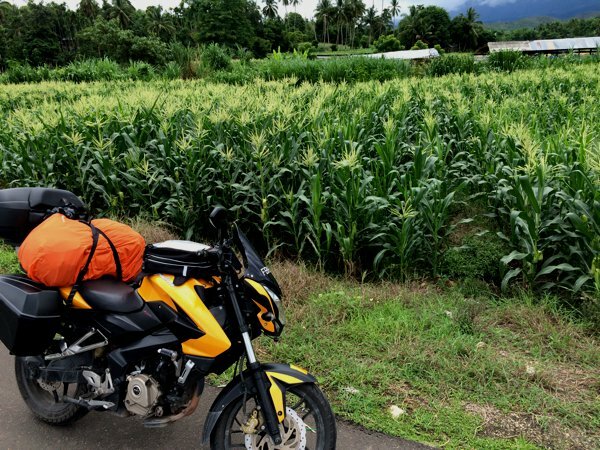 Me, my bike, and a corn-ny background in a corny pose. 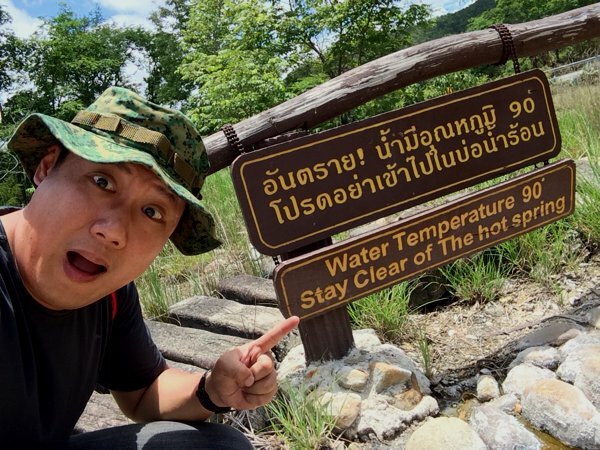 Thepphanom hotspring. This one is hot enough to cook eggs. I didn’t try though – no eggs only chicken; I was too chicken to get near the hot water. That’s approximately 90degC or 194degF. 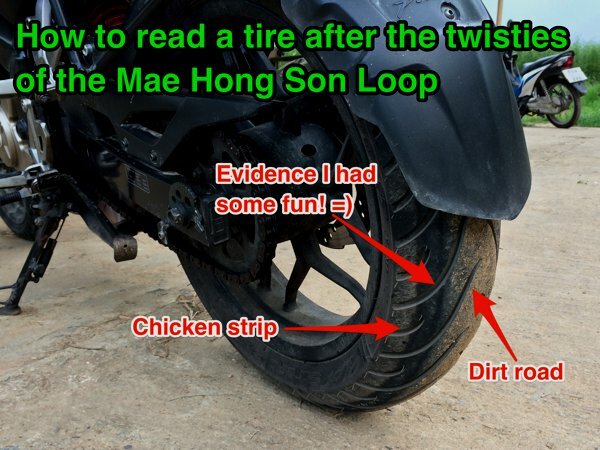 Speaking of chickens, I noticed an interesting pattern on my rear tire. So I arrived at Mae Sariang and stayed a night. Just a quiet little town. Nothing too special. But that quietness and serenity was probably welcoming, and I had some of the best rest in quite awhile. 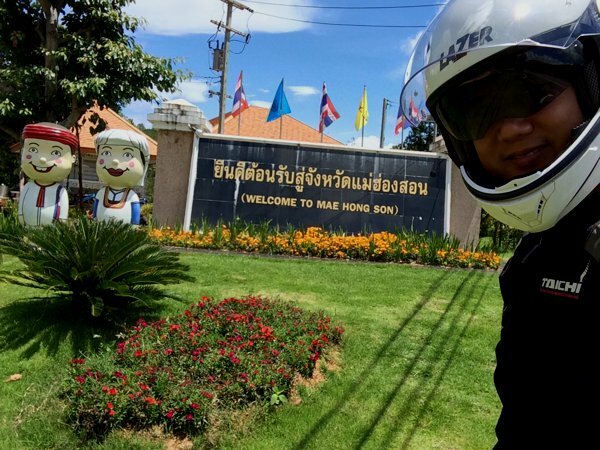 Welcome to Mae Hong Son! 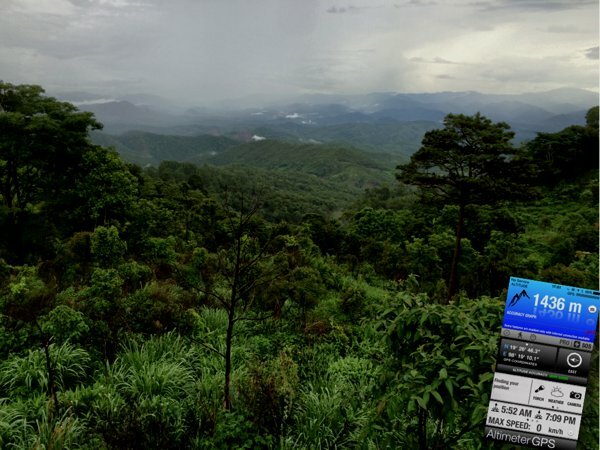 The name “Mae Hong Son” refers to both the region and the main town in the region. This sign was referring to the region, and not the town. After 5,000km of riding, I finally went for an oil change. Brought my own oil (not so important) and filter (important) along to a local shop here in Mae Sariang. 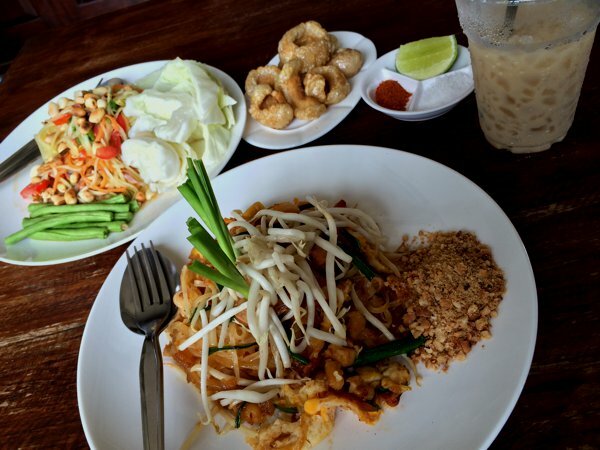 Cost of labour – 40THB, or approximately SGD1.55! I brought along the necessary tools and was prepared to do my own oil change if I had to. But hey! I’d gladly pay these guys 40THB to not have to break a sweat and dirty my hands. 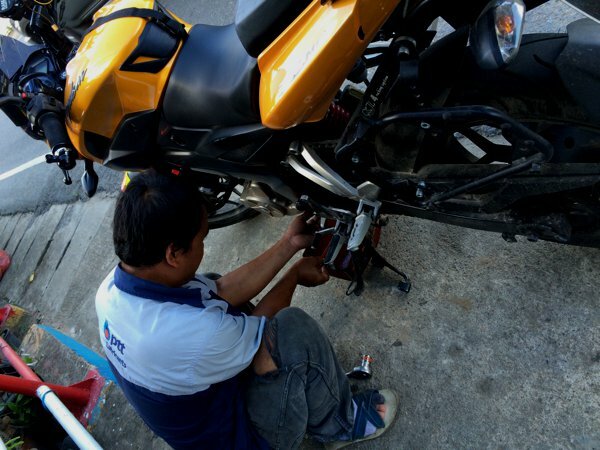 Yes – the entire oil change operation was done by the road side. Lol. 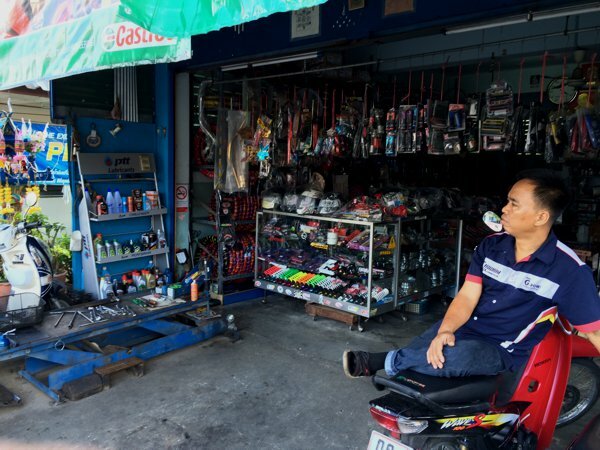 The motorcycle shop in Mae Sariang where I did my oil change. The carbureted Pulsar 200NS has been performing decently well so far. But lately, it seem to be idling strange – sounds like a choking generator diesel engine. And now, it’s impossible for me to start the engine in the morning without it dying. Have to use the choke for a few minutes to let the engine warm up. And no, I wasn’t in high’ish altitudes when I noticed this – just about 220m above sea level. Maybe it’s just the bike not taking the gasohol too well. Oh well, I’ll just monitor it for now. 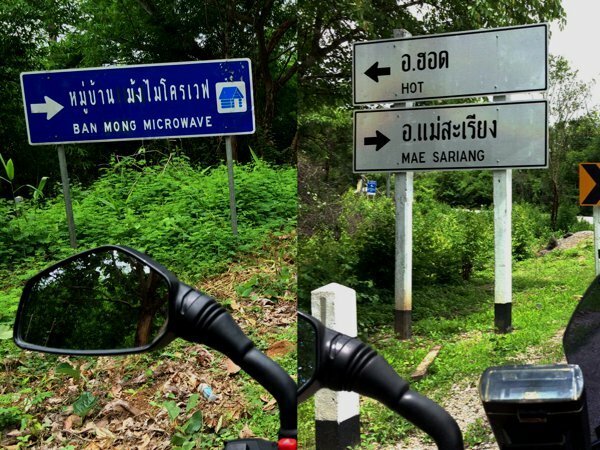 So I left Mae Sariang after 1 night, and headed towards Mae Hong Son (the town). Finally! A highway cafe with a mainly English menu! 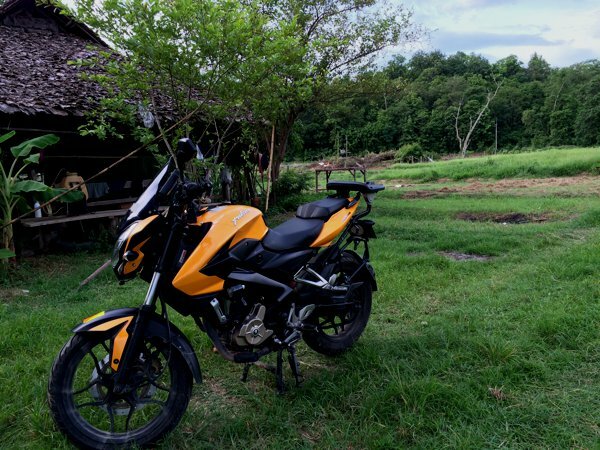 The Pulsar 200NS countryside shot. Kinda sums up the weather and the reason behind it. I seriously have got no idea what Ban Mong is. But whatever it is, I’m not getting anywhere near there. 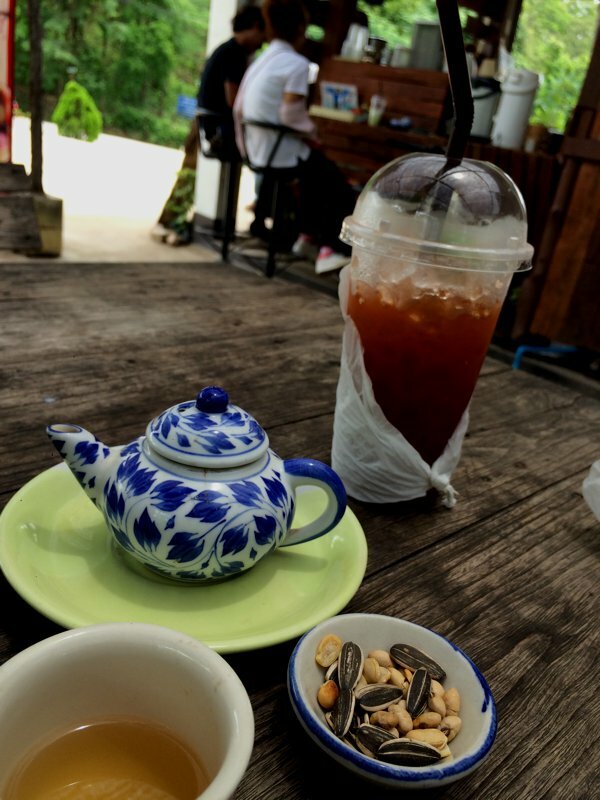 Enroute to Mae Hong Son, I came to a scenic rest stop with a little cafe. I ordered an iced lemon tea. It came with a free pot of hot tea and some nuts. 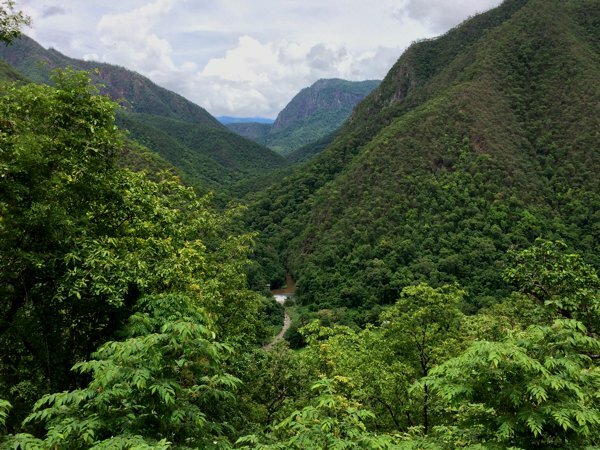 The view of the valley at the scenic rest stop just before the town of Mae Hong Son. Isn’t nature just so awesome! 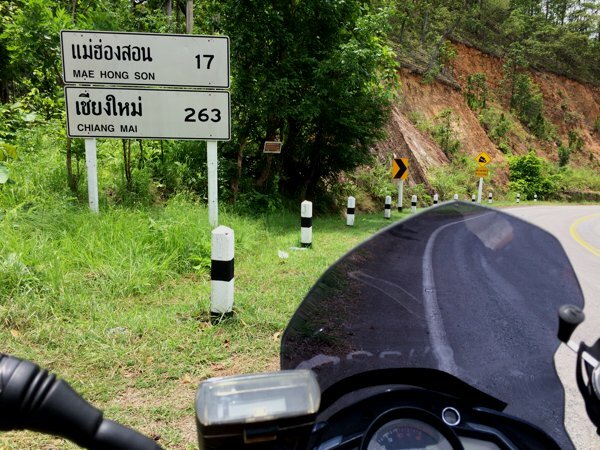 17km to Mae Hong Son! 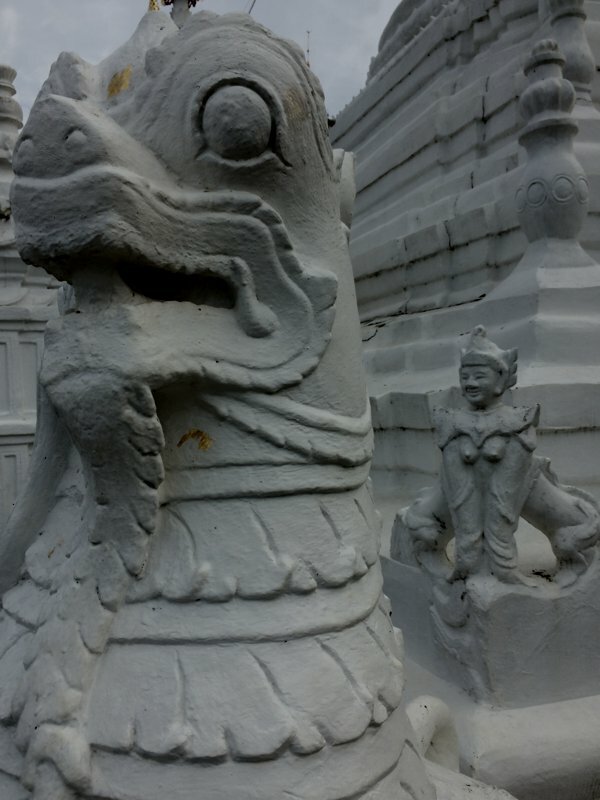 An unknown Wat along the way. What? Yeah – wat. 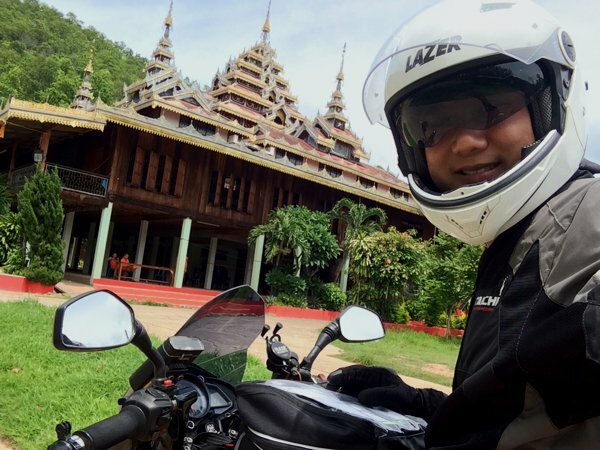 So I reached Mae Hong Son and started looking for an accommodation. 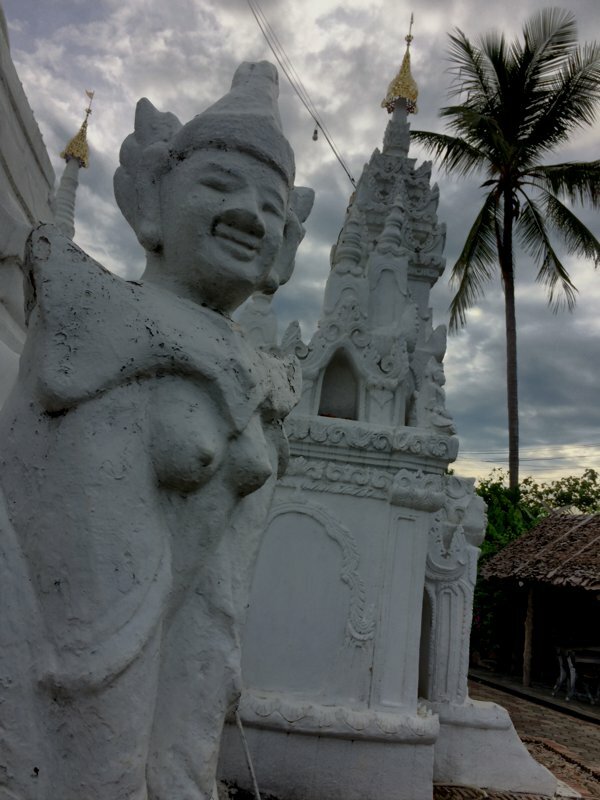 I eventually opted for a sweet little bungalow about 4km away from town for 600THB a night. 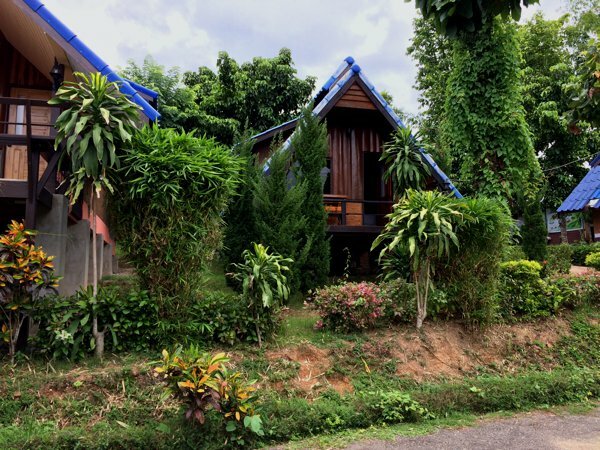 My bungalow in Mae Hong Son. Stayed a night here. 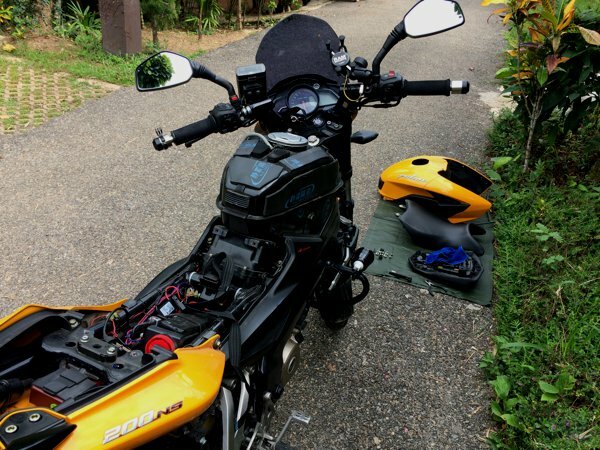 Shortly after I arrived, I inspected the oil and coolant windows of the bike. Oil looked okay, but coolant looked strange. Despite some vigorous shaking, I couldn’t see the coolant level. So I opened up the bike checked on the radiator and overflow tank, and only to realise that the liquid level in the overflow tank was above the max mark – which explains why I couldn’t see the liquid level. 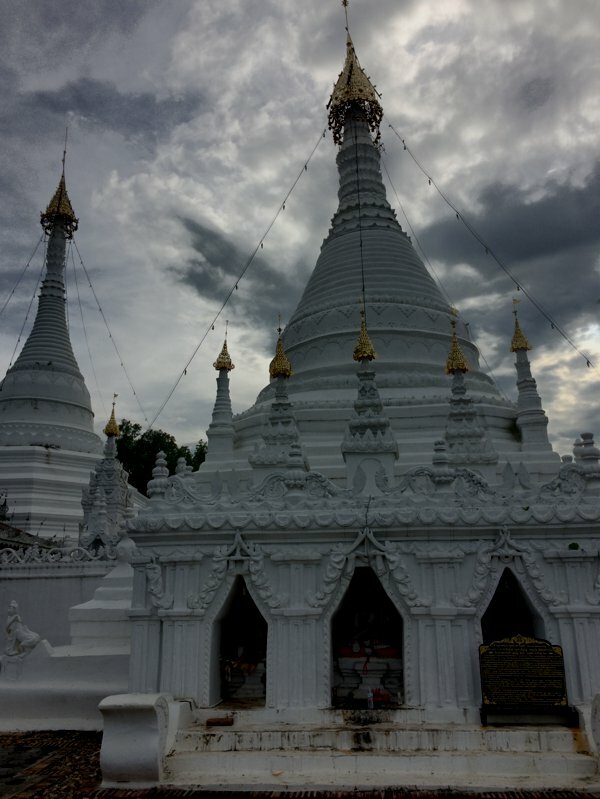 I fired up Trip Advisor app on the iPhone to search for things to do around Mae Hong Son, and the #1 recommendation was Wat Phra That Doi Kong Mu – a white wat at the top of a hill. Wat Phra That Doi Kong Mu in the evening. A different angle of Wat Phra That Doi Kong Mu. The view from Wat Phra That Doi Kong Mu. 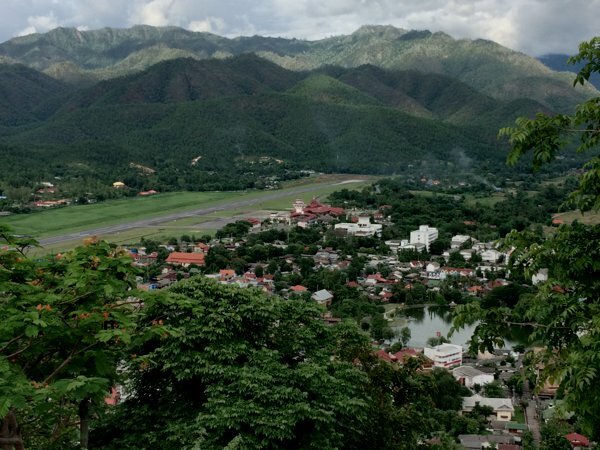 You can see Mae Hong Son airport’s landing strip from here. 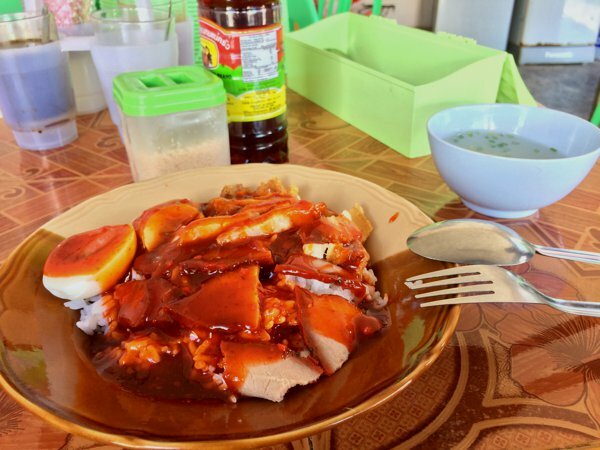 As I explored Mae Hong Son the next morning, I wandered into a pigsty, and so I decided to explore the origins of all the pork I’ve eaten in the past few days. Riding into the pig farm. Yup – no roads. 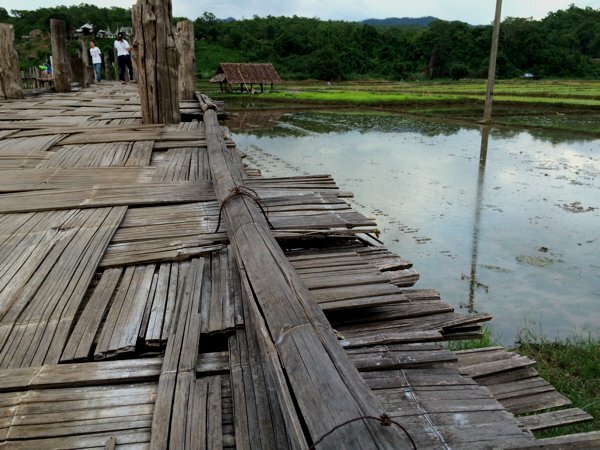 #2 on the Trip Advisor’s list of things to do in Mae Hong Son was the Sutongpe Bridge. The Sutongpe is a bridge with intricately weaved bamboo for the floor. It leads up to a monastery on a hill. The Sutongpe Bridge bamboo weave. This little guy was playing with a dog on the Sutongpe bridge. Update: Yup – he DID eventually manage to get the dog into the mudpool below. 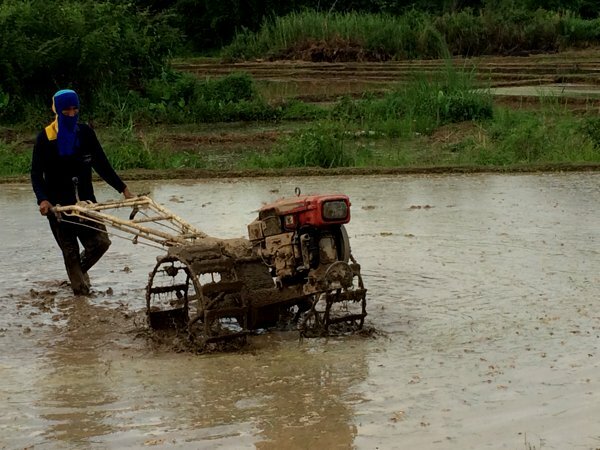 A farmer tilling the pady field at Sutongpe. 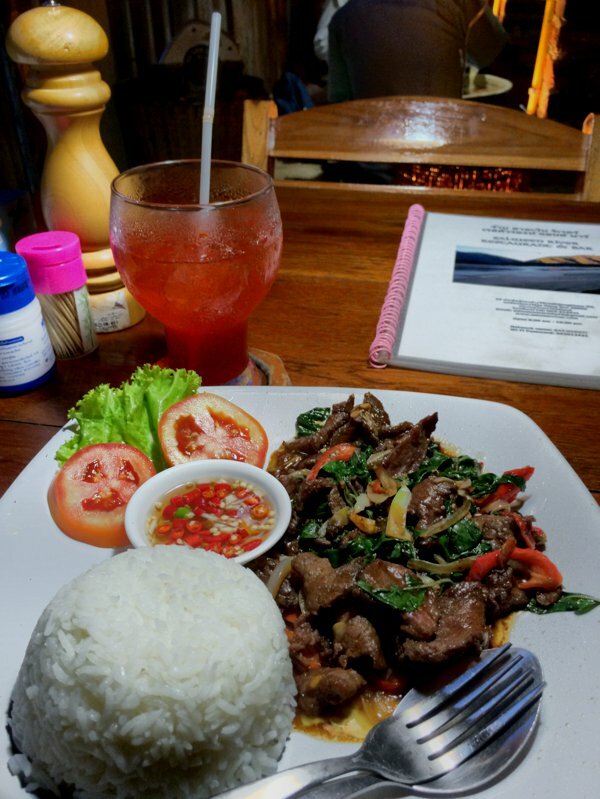 Dinner in Mae Hong Son – stir fried beef with basil leaves and rice. 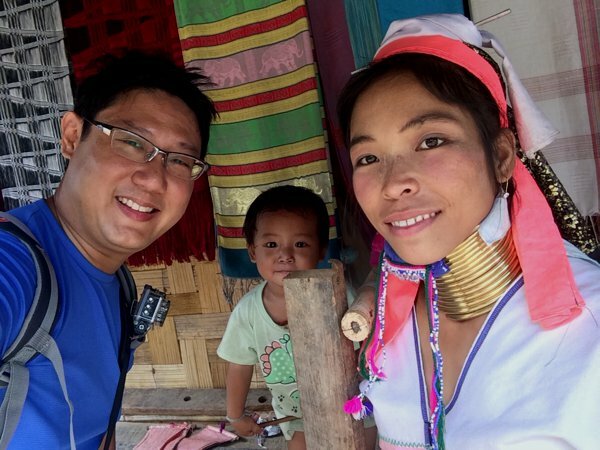 And after resting one night in Mae Hong Son, I headed to the nearby Kayan or Karen (aka “long neck”) village. I’m aware of the controversies of these “human zoo’s”. These villages were formerly refugee camps during the Myanmar-Thai conflict, when these Kayans fled Myanmar into the borders of Thailand. 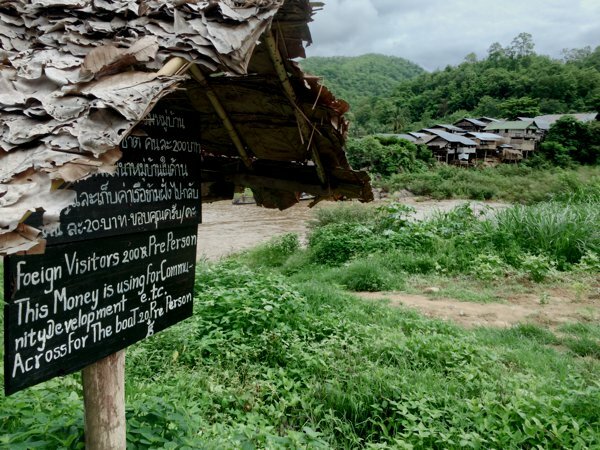 When the Thai provincial government initially didn’t allow these Kayan refugees to take up re-settlement offers – effectively turning these villages into a “human zoo”, the UN High Commissioner for Refugees (UNHCR) expressed reservations for tourists visiting these villages. But this was later relaxed in late 2008, and the Kayans are now eligible for re-settlement. I think the ones remaining in the villages are not coerced, but decided to remain and preserve their tradition. 200THB per tourist. Plus 20THB for the boat ride. Yes – they are isolated by the river. 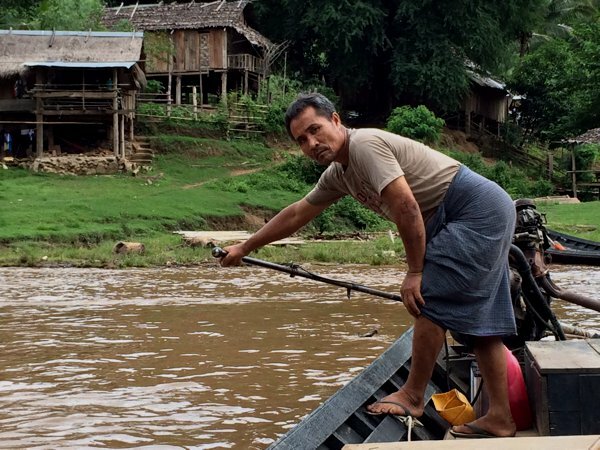 The boatman taking me to the Karen Village. Say cheese! Oh, I gave the little one a printout of this photo from my LG Pocket Photo printer. He was so pleased! 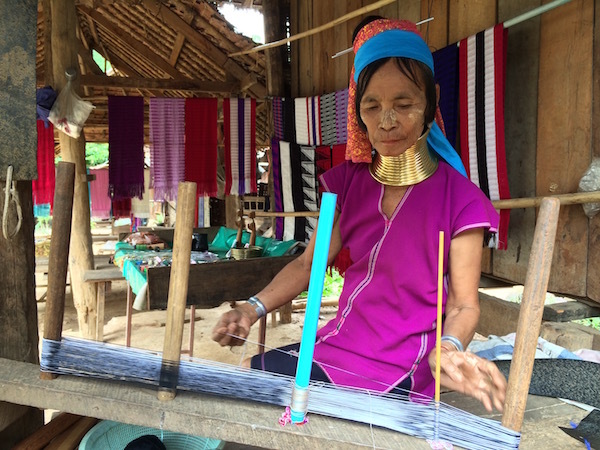 This lady was weaving a scarf using only very basic tools. I bought one from her for 100THB. 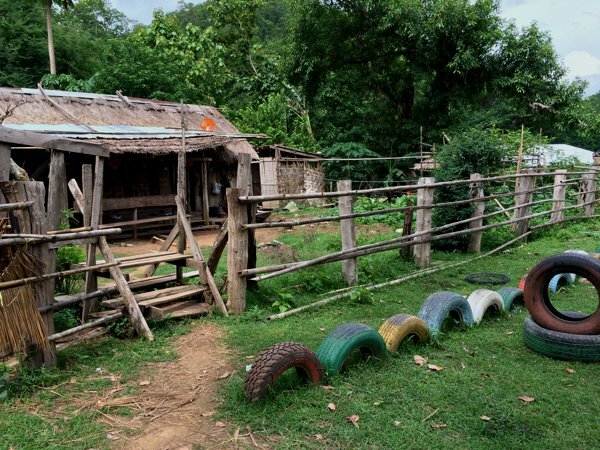 That’s a school in the Karen Village. 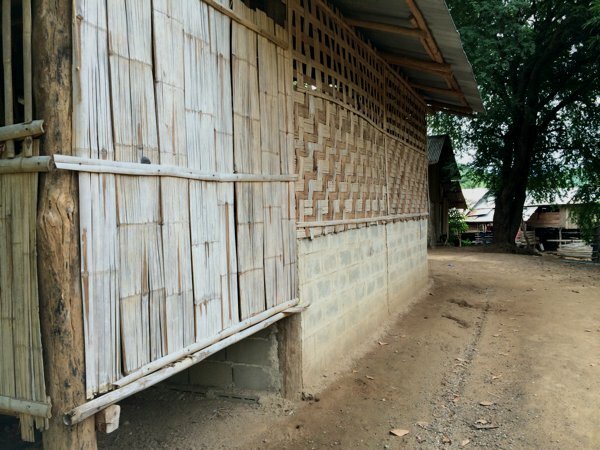 The walls of most buildings here in the Karen Village are made of woven bamboo. 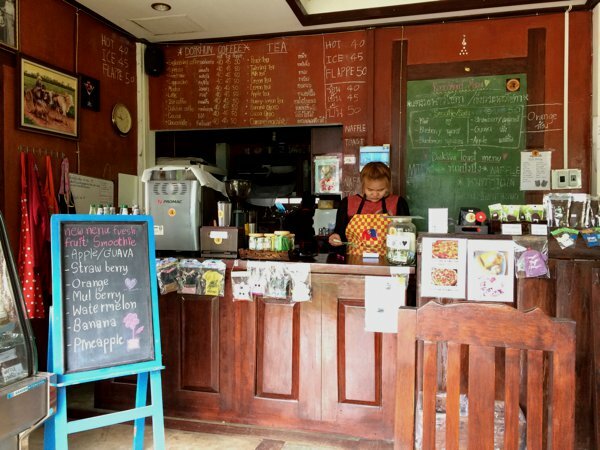 The next day, I headed to Pai – the next town before returning to Chiang Mai. Enroute, I visited some caves. Maelana, Dimond and Coral caves. I visited the latter two. 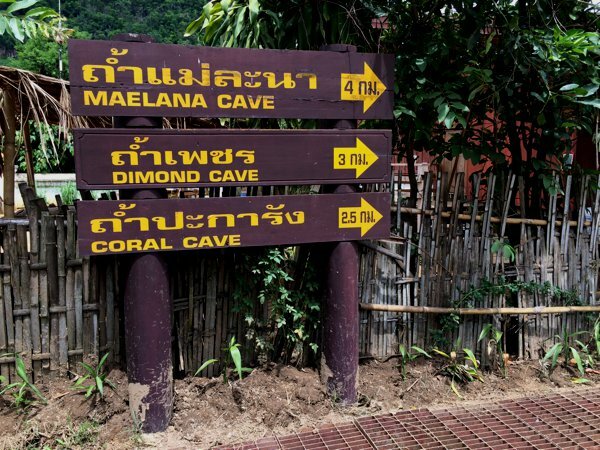 At the entrance of the caves, the signboard informed that it’s 200THB to visit each cave – AND you MUST be accompanied by a cave guide. Initially, I thought to myself that this must surely be a tourist trap. 200THB per cave? Really? But since I was already here, I paid 400THB for 2 caves, and off we went! They allowed me to ride my bike up closer to the cave sites, and boy! This was probably one of my scariest rides! The roads were so slippery and steep that I literally had to “walk the bike” instead of riding it for fear of falling. But once at the caves, I immediately understood why a guide was necessary. We had to craw through crevices barely large enough to squeeze through and the multiple paths inside the caves literally meant that one could get lost inside if he weren’t familiar! And nope – no GPS reception inside! 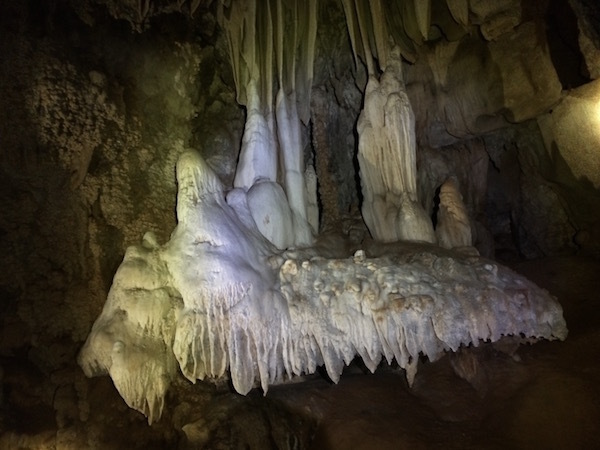 The stalactites and stalagmites formations inside these caves were beautiful. And you can quite see the water droplets hanging on the end of a stalactite just above where a stalagmite was forming. The guide however, instructed me not to touch them so that they could continue to form naturally. While cave exploring, we came across 2 sites with vandalism scribbled on the walls. The guide later explained that these were done by some Chinese tourists. Shame on you, Chinese vandals! Boo! One of the better photos I managed to take inside the pitch dark cave. 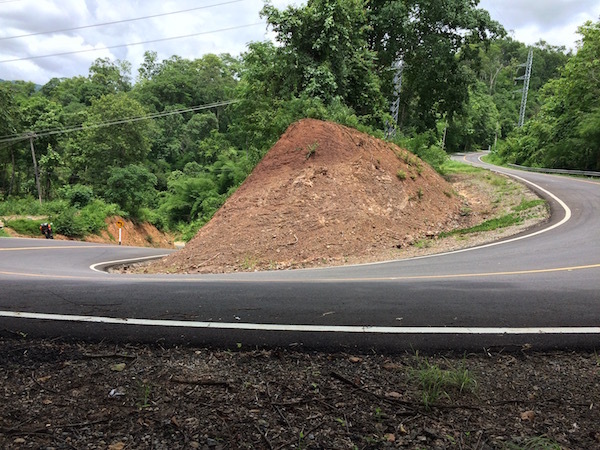 Enroute to Pai, I came across some of the most winding roads I’ve ridden so far! One of the MANY hairpin bends on the route! Can you spot the Pulsar 200NS? Really?!? Who designs roads like these? And if you think this looks bad on a 2D gps map? Try imagining this in 3D where many of the bends are ascending or descending – STEEPLY! I stopped at a scenic highway stop for some lunch – at 1700h! 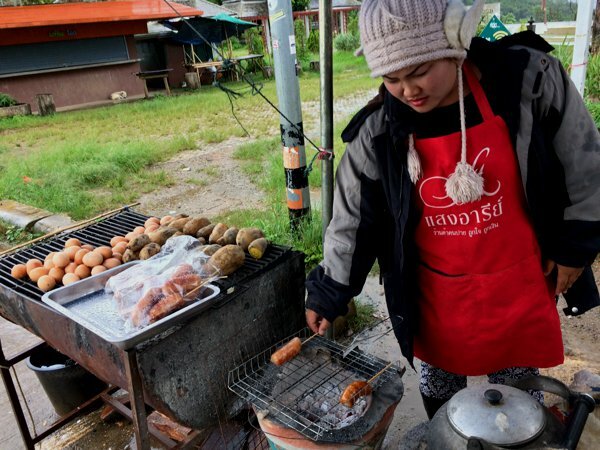 Yup – I was too engrossed caving and riding that I forgot about lunch until I smelled the barbecuing sausages. 20THB x 2! Yum! And yes – it was cold AND raining. Awesome view from the highway scenic lookout at 1,436m (4,711ft) above sea level. The sun was setting soon – had to get to Pai quickly. I reached the town of Pai before dark and checked into my accommodation. Just I was heading out to the Pai Night Market, it started raining. So I took shelter in a nearby restaurant and had dinner there. As I arrived Pai rather late and didn’t have time to explore the town due to the rain, I was thinking if I should stay another night. Bah… too wet, too cold and too tired now. I’ll decide tomorrow. 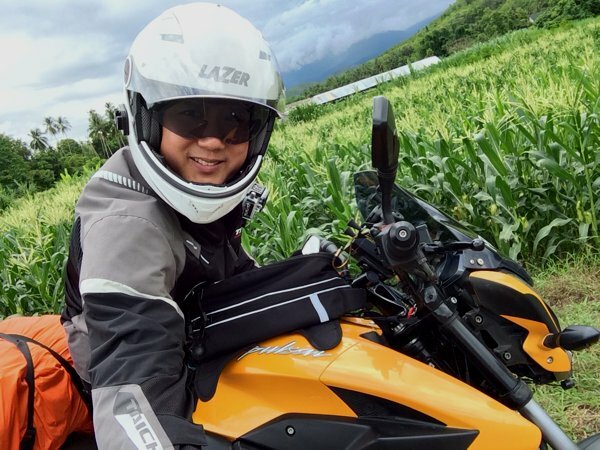 Next Next post: The sgBikerBoy 2016 Trip – Day 12. Breakdown in Pai. 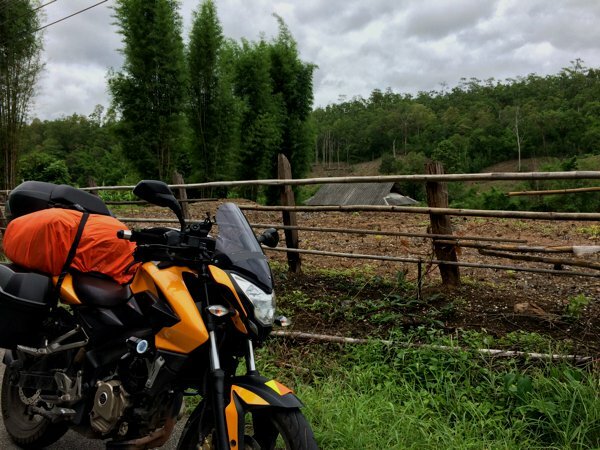 ← The sgBikerBoy 2016 Trip – Day 8 ← The sgBikerBoy 2016 Trip – Day 12. Breakdown in Pai.